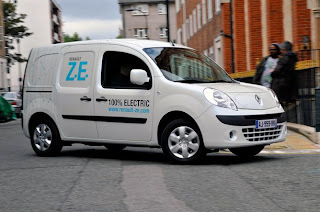 Renault has taken the wraps off their first all-electric van, the Kangoo Van ZE (Zero Emission), which will go on sale in the UK for £16,990 minus VAT. The Kangoo is powered by a 44 kw electric motor with maximum torque of 226 Nm. The batteries are located in the centre of the vehicle under the floor and a standard charge via a 220V 16A socket takes between six and eight hours with the 25 kWh battery giving the vehicle 100 miles range. Customers will be able to purchase, or rent, the van and take out a subscription for the battery. In the UK, this will cost from £59 per month minus VAT, based on four years, 9,000 miles per year.